Inheritance: The literal meaning of the term inheritance is to receive something by succession. This is true for the inheritance feature of java as well. It means that one class, known as a child class or sub-class, acquires the behaviors and properties of another class, which is called the parent class or super class. Inheritance is useful for two main reasons: code re-usability and method overriding. When a class inherits the properties of another class, then it acquires its fields and methods, and there is also the option of adding new properties. Therefore we do not need to write the code again and again. Method overriding is a feature that allows us to override the method of the main class with that of a sub-class. This is useful for polymorphism. This type of inheritance refers to the extension of one class by another. So there is one parent class and one child class. In the above image, class B extends class A.
Multilevel inheritance is a chain of inheritance. As in the image, class C inherits from class B while class B inherits from class A. 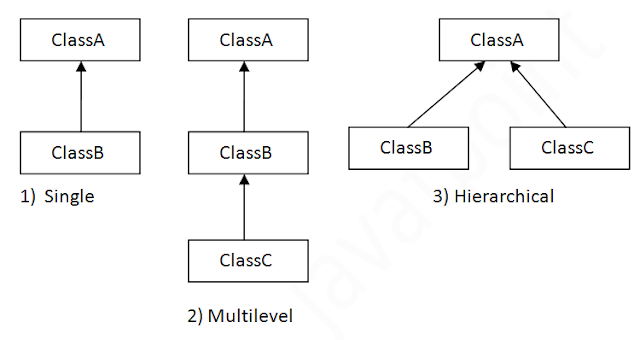 In Hierarchical inheritance, one class is the parent class while there are two or more child classes. For example, in the above image, class B and class C both extend class A. Note : unfortunately Java doesn't support Multiple Inheritance and Hybrid Inheritance.